I love to cook Italian. It’s easy, simple, rustic cooking. It’s just natural for me which is odd since I’m only a quarter Italian (I look and sound way more than that though). My relatives are from Bari, Italy. It’s a coastal town right at the ankle of the heel of the boot. While they grow a ton of tomatoes there, they are on the water and fish is a big deal there too. So when I was pressed to come up with a name for this pasta dish, I named it “Pasta from Bari” because it’s simple, rustic, and something they would totally eat there. 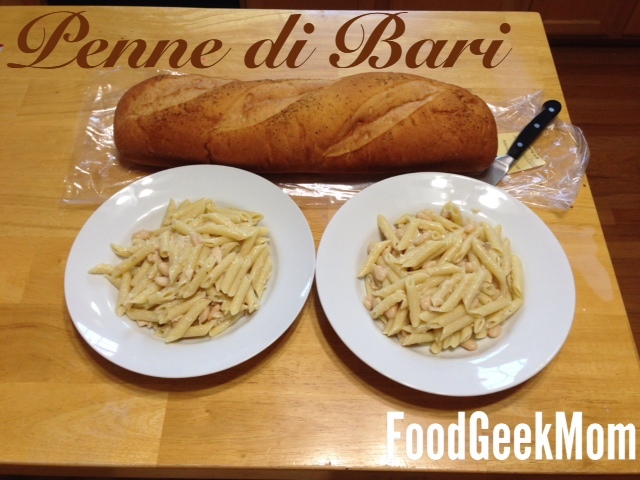 Cook pasta until al dente according to directions (usually about 11 minutes for penne). While pasta is cooking, put drained tuna into a bowl. Add beans & the basil. Stir, taking care not to crush the beans. Add 1/2 cup of boiling water (you can use the pasta water). Drain pasta and return to the pot. Add the tuna mixture as well as up to 1/2 cup of olive oil. Add most of the cheese (saving some to sprinkle on top for presentation). and gently stir again. Scoop into plates and top with a bit more grated cheese. Tip: Cannellini beans are also knows and Great Northern beans or white beans. Tip: We prefer Locatelli which is a Pecorino Romano cheese (it's a hard, salty goat cheese - similar to Parmesan cheese which is a less salty, more subtle cow's milk cheese people are more used to here in America). Tip: For a lighter, summer fare - to the tuna mixture add 2 tablespoons of chopped capers and 2 teaspoons of fresh lemon juice. Capers are pickled buds of a caper plant. They are very popular in Italian cooking and add a distinct flavor similar to olives. The lemon juice lightens the flavors and works well with the tuna. Tip: For a veggie boost, try adding halved cherry tomatoes to the dish! Simple heat in a small amount of olive oil and then gently stir in. Adds a great pop of color as well.